I come across inspiring things quite often. When I’m online, they usually make themselves known through related videos or articles; sometimes in a new post from someone I’m already watching/following (no way to say that without sounding creepy XD). Offline, I discover inspirational things on the radio in songs, talks, or sermons, and in sermons and Bible classes at church. I can be inspired by talking with my parents or friends, or reading something in a book. It happens all the time. These little bursts of inspiration spur me on to do better, to try harder, and ultimately improve in what I do and how I do it so that I can successfully get things done in a time frame that is suitable to be and with the quality that I expect it to be. However, even constantly being inspired, as exciting as it is, becomes a part of daily life… That is to say while I have been doing a LOT better, I think I hadn’t quite realized just where I was putting my focus–dividing my focus, if you will. In my last post I complained of feeling caught between two emotions: the desire to organize and the desire to draw. My inspiration was to do both, yet it was creating conflict inside me and I became annoyed with myself rather than motivated to do anything. In frustration at not having anything new to upload (I could upload artbook pictures but that would largely spoil the surprise ^^; ) I said I might start posting older sketches just to have something uploaded. I didn’t do it; rather, I haven’t done it yet because I worked myself out of that conflicting place and drew. In a typical burst of inspiration to do something, I will run with that one thing for two to three days. This usually starts with drawing and goes like this: drawing – singing/writing – writing/singing – translating stuff – getting bored and wanting to draw but lacking motivation to do so – getting inspired and drawing again. It’s a very tiring cycle, and if you throw in website-related things, graphics, learning Japanese (and practicing with it! ), and blogging it becomes such a chore to do everything! My mom suggested I try to take advantage of the cycles/phases, so that was what I had in mind as I wrote down the ten things and made the mock schedule. However, I really didn’t quite feel that it was the answer. I started the “drawing phase” on Wednesday, February 22nd (last week, same day of the previous post!) and kept it up for longer than usual by keeping my motivation and inspiration levels high. I had drawing process videos from YouTube playing at random as I drew, and I listened to Vocaloid music and played dance cover videos as well. In that time I was very productive, and motivated myself further by satisfying the desire to organize things–I did a lot of the page layout planning of my artbook during this time as well. The file I created last Wednesday was last modified this past Tuesday (the 28th). But, even though I sustained the “phase” longer than usual, I still switched…into a translating/singing/(sort of)dancing phase. 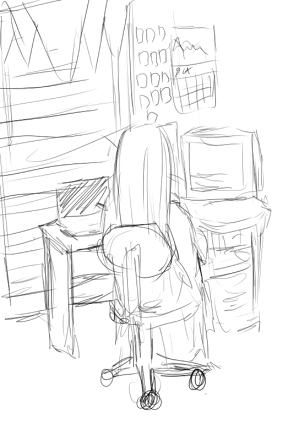 On Tuesday (the 28th) I barely drew at all (just worked on coloring bricks) and did a lot of translating and singing. I did some kanji and writing practice, and learned some of a dance. That was all well and good, but I knew that I was transitioning into a phase and I DID. NOT. LIKE. IT. Irritated, I browsed YouTube for a while…and then I found it: new inspiration. But this inspiration was not a little burst like I find all the time…this was huge…like the time I found Koichi’s Tofugu and TextFugu, and the time I found Danny Choo’s site and amazing post on how he learned Japanese and got to Japan to live his dream. Koichi and Danny both got me to really rethink the way I go about doing things, and this new source of inspiration is definitely one that has brought about a change again. I came across a video by ciaela (Mikaera) thanks to YouTube’s related videos feature. I’m not sure which one it was; I think it was the one about a pancake-flavored drink, actually. ^^; Anyway, it was amusing so I decided to look at her other videos. Her most recent video is set to autoplay, and it amazed me because she speaks Japanese very well (she is a gaijin like me) and with such ease…like native fluency. What amazed me almost more than that was the fact that I could understand what she was saying almost to the point of not needing the subtitles. And that really shocked me because I don’t feel like I know a lot of Japanese. She enunciates very clearly, so that probably helped. ^^; Main point is I looked at one of her other recent videos…it was a New Year’s video, and I really liked her visual explanation/advice. Drawn out in a linear format so it doesn’t feel like you’re climbing up a mountain during your journey and effort to get to where you want to go, but merely walking forward and checking things off of your list as you achieve or obtain what you want, the simple diagram consists of “me”, “future me”, and a line drawn between those two points. On that line, similar to how you would do a timeline, you write down the things you will have to do in order to become the “future you”, which is the you who has accomplished the thing(s) you want to accomplish. This inspired me so much that the next day, for the entire day, I had my GenkiJACS document open and I was thinking of what to do, writing down my entire thinking process. I copied the ten things I had listed before into the document and underneath each item on the list I typed up the steps I would need to take in order to accomplish it. I only got to the fourth item, though, because I realized something very important. Only the top four items are the ones I really care about right now–the only ones I really need to devote my time to. Writing it all out like that really put it into perspective. Before I had a pretty good idea of what I needed to be doing, but in the end I was still just aiming randomly, doing whatever I felt like doing. As I said before, only those top four things are what is really important to me right now. I think it’s no coincidence that they are listed first. 😉 In the back of my mind, I knew they were most important all along. I want to endeavor to finish my artbook this month too. I’m not 100% sure if I can do it, but I’ve been doing a much better job as of the past four or five months, so I have more confidence in my ability to follow through/pull through this time. If something else comes up, I’ll just have to ignore it. >P I have 31 days this month, so I have the maximum number of days to meet this goal! The race is on. Now all I have to do is take action.